Cassani LS, Chouhan J, Chan C, et al. Biliary decompression in perihilar cholangiocarcinoma improves survival: a single-center retrospective analysis. Dig Dis Sci 2018. Doi: 10.1007/s10620-018-5277-z [Epub ahead of print]. Trikudanathan G, Tawfik P, Amateau SK, et al. Early (< 4 weeks) versus standard ( ≥4 weeks) endoscopically centered step-up interventions for necrotizing pancreatitis. Am J Gastroenterol 2018. Doi: 10.1038/s41395-018-0232-3 [Epub ahead of print]. Hanaoka N, Ishihara R, Motoori M, et al. 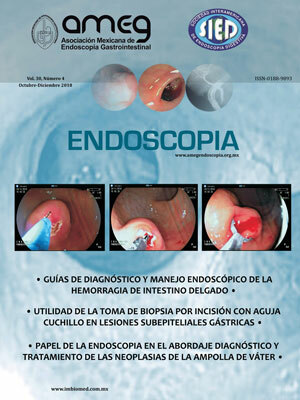 Endoscopic balloon dilation followed by intralesional steroid injection for anastomotic strictures after esophagectomy: a randomized controlled trial. Am J Gastroenterol 2018. Doi: 10.1038/s41395-018-0253-y [Epub ahead of print].